Gift giving is one of our biggest traditions. Certainly the tradition we spend the most time on as we shop , wrap and put gift tags on them and place the gifts under the tree—Why? Christmas is God’s gift of His Son to a world he dearly loves. John 3:16 says, “For God so loved the world that he gave His only begotten son, that whosoever believeth on Him shall have everlasting life. That was the first Christmas gift. Luke 2:12 ” And this shall be a sign to you; Ye shall find the babe wrapped in swaddling clothes, lying in a manger.” Swaddling cloths are burial cloths. Symbolic of the fact that Jesus was born to die for us. 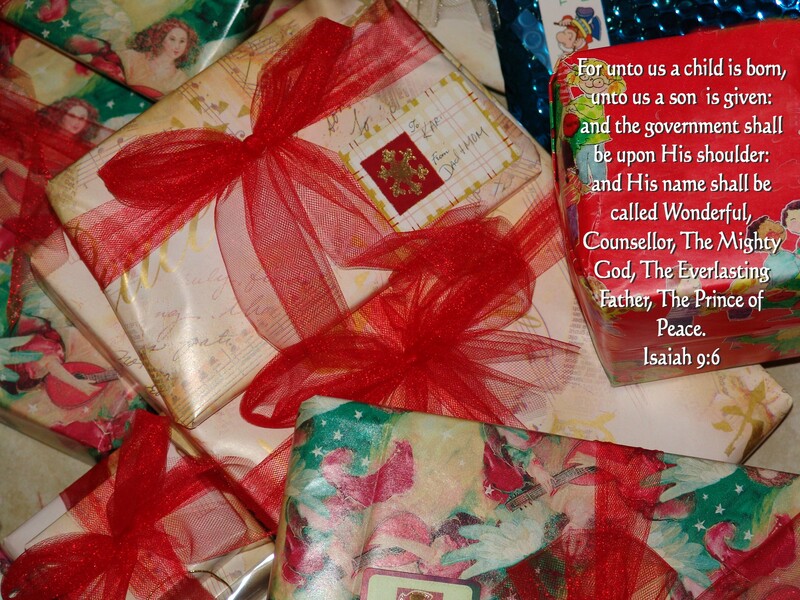 Isaiah 9:6 says, “”For unto YOU a child s born and unto US a son is given. You see snow everywhere at Christmas. Much of the snow we see is not real, but it covers the branches of our Christmas trees. Snowmen frolic all over town, so fun to look at, especially for the children. Isaiah 1:18 says, “Though your sins be as scarlet, they shall be as white as snow.” When the Father sees us, He sees us like branches covered with snow. We are washed clean by the blood of His son, Jesus. We are covered in His righteousness. 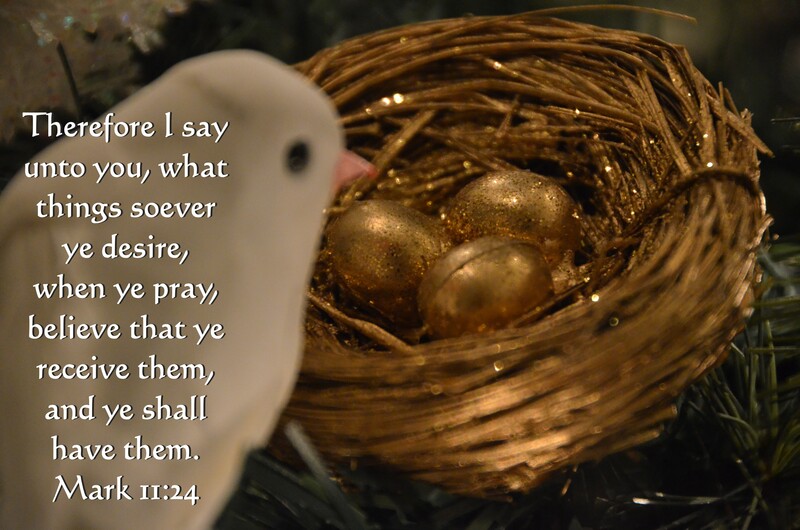 Remember that this Christmas and give thanks to the Lord. lights can be symbolic of Christmas because we are many colored, and serve in many different callings, We are all in different stages of spiritual growth also. Yes we are all different, but we are all connected to one power Source. If your not on the cord and plugged in to Jesus, Become one of His lights this Christmas. 1 Thessalonians 5:14b says, “Take tender care of those who are weak, for when one of us is weak, the other is strong. 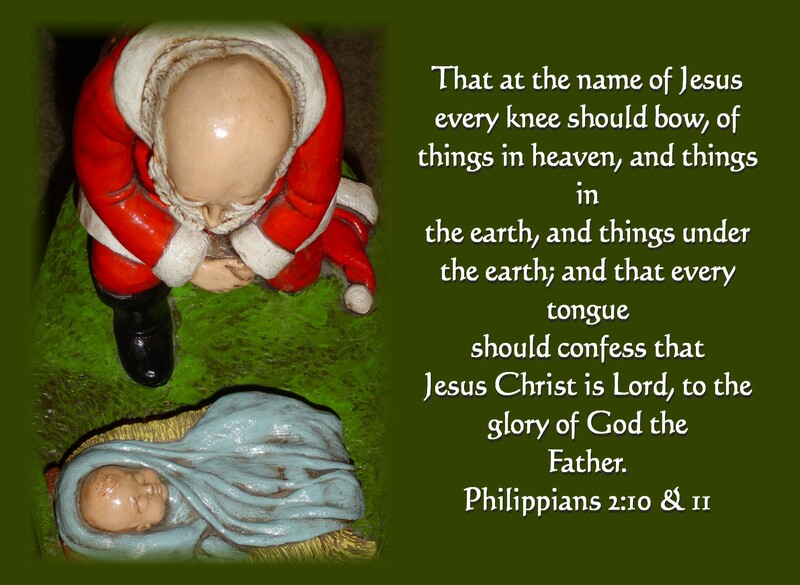 Lets ask the Lord to give us eyes to see Him in our Christmas traditions. He lp us Lord to see you in all that we do. It’s a very busy time of year, but help us take the time to see you. to the preparation of that special tree. 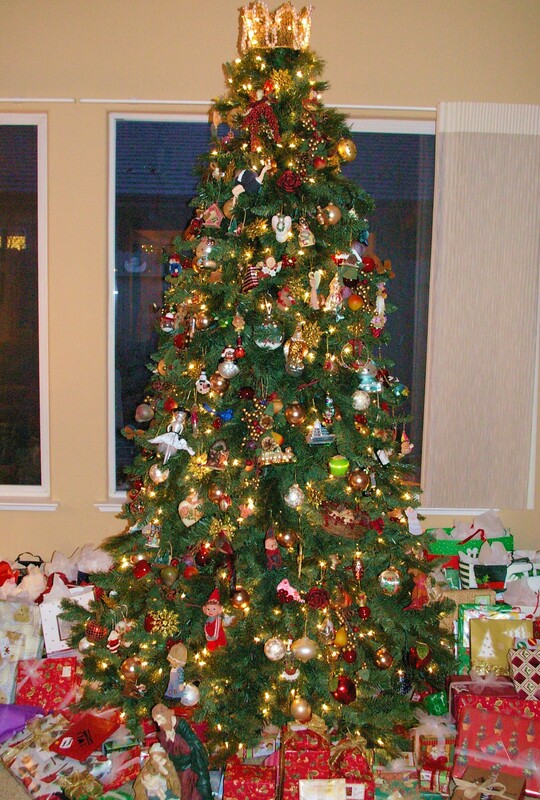 It is a lot of fun and very beautiful, but have we kept our Christmas tree Christ centered? there can be in these branches and decorations. The trunk of the tree and the branches…..
Jesus is the vine, the source, and the branches are connected to Him. If the branch be separated from the vine they will surely die. Jesus is like the tree….Isaiah 53:18 “He was cut off out of the land of the living.” Yes He was cut off just like our Christmas tree was cut off. Child, a baby in the manger. The most important thing to remember is Jesus the Lord, who died for the remission of our sins. He went to the Cross for us. The Hope of a tree…. Yes, Jesus rose again from the grave and the tender branches, who are us, the Church, have never ceased. The tree just keeps growing and growing. That is our hope! Our hope is in our tree, Jesus Christ who is risen! Hallelujah! Christmas is such a beautiful time of year, it is so special! There is warmth, love, and inspiration that is found at no other time of the year. Love abounds at Christmas time, it is everywhere. People remember to care for one another and correspond with people they never see all year-long. It is a giving time, generosity is very present. Many reach out and help the unfortunate. I wish that would happen all year long. Hearts are stirred, pricked, and even broken. The air is full of fragrance and colorful sights. There are a lot of feelings also at this time of year. Sometimes it feels wonderful, sometimes it feels sad, and sometimes it is Jesus tugging at your heart, saying, “Remember Me , I am the reason for the season!” Millions upon millions of people celebrate Christmas all over the world, but relatively few of the millions who celebrate truly know the true meaning of Christmas. Other things take priority over Jesus, and the celebration of His birth. Lets change our focus this year and keep our eyes on the Lord Jesus. It will touch your heart deeper than anything else. You will never be the same. I Love the account of the Wise Men in Matthew Chapter 2. The Bible doesn’t say three Wise Men but Tradition has held to that number. There were three gifts, so I think that’s how the number of men was established. There could have been many wise men. They were astrologers, and studied the stars. They must have seen something very special in this star that they saw in the East They came to Jerusalem to see Herod and ask him where was this child that was born. 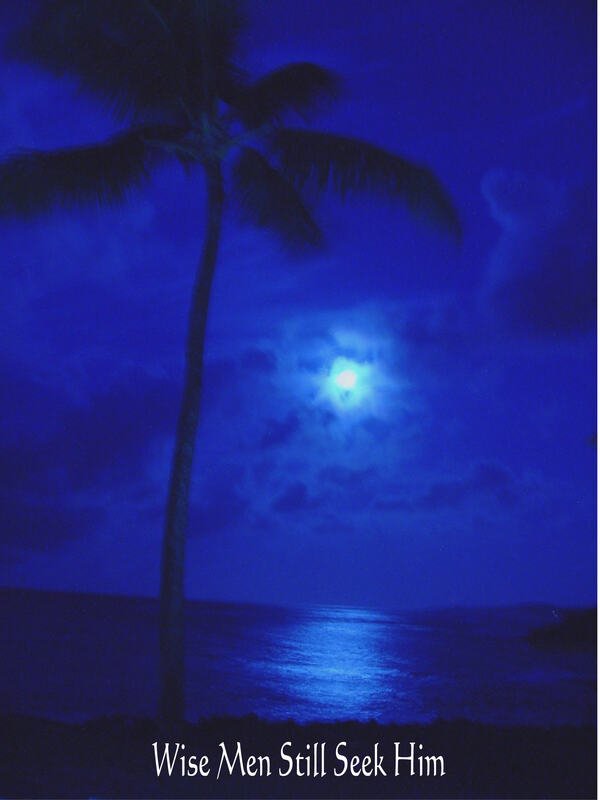 They must have received a devine message as well, when they saw that new star in the sky. Herod was angry and concocted a story, that they should find the babe so that he Herod could worship Him. They left Herod and followed the star. It went before them and led them to Bethlehem. The star actually stood in the sky over the place where Jesus was. When the Wise Men saw Jesus, they fell down and worshiped Him. They gave him treasures of gold, frankincense and myrrh. Gold is associated with kings, and Jesus is the King of Kings. Frankincense, is often used as incense in worship. Jesus is to be worshiped. Myrrh is a perfume that was put on dead bodies and Jesus would one day die to save His people from their sins. The Wise men had a dream that Herod would kill the child if they went back and told him where He was. So they went back to their homeland another way. Thanks to those wise men, Herods’ plan failed and Jesus went on to save us from or sins. Heavens Gift to us and the Reason for this beautiful Christmas Season. Sitting by our Christmas tree one day, I noticed this tiny scene in the tree . It made me think about the faith that our beautiful God created, birds have. They lay their eggs and faithfully sit and wait for the day to come when they will hatch. They Believe!!! We all desire things, and there are times when we just need things. Sometime big things, sometimes small. It might be healing that we desire. Salvation for a loved one is a huge need and desire. Believe, and ye shall receive! We often desire and pray for things, but we don’t really believe. I have seen the Lord bring the desires of many hearts. I believe, with all my heart that the Lord can and will give you the desires of your heart. Can you believe?